Smooth seas do not make skillful sailers. 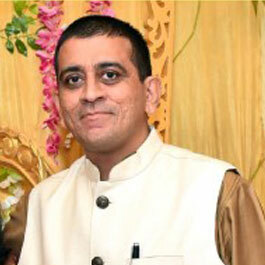 Sanjay is qualified CA and CS with diverse Management, Finance & Business experience of 18+ years, having developed expertise in implementing best finance practices, strategizing business plans, raising funds, initiating growth strategies, executing performance management frameworks along with the usual finance functions. Focus on leading & managing CFO function as a key driver to business with strong emphasis on people connects & knowledge management. Have contributed in growing enterprise value with guided financial controls. Passionate about enterprising and loves exploring new initiatives, grow business & serve business owners with integrity & commitment. An ardent finance expert but more than numbers loves science behind the numbers that makes strong linkages while integrating business & finance. We have the team of experienced Financial Controllers/CFOs (qualified Chartered accountants/Cost accountants & Company Secretary), spread across major metro cities in India either through our associate partnership program or via solid alliance partnership. All of them carry rich & diverse experience of 10-18+ years in Indian Corporate sector having worked with MNC's, Domestic Large/ SME (Established & First generation) segment, Private Equity Group etc. covering entire gamut of financial controller function. They are all well versed with best of management practices with proven capability to deliver benchmark business finance parameters creating measurable value for our clients. Whenever we need to ramp up our team, we hire best of qualified & experienced resources to serve client under our guidance, training & giving them orientation on our proprietary shared CFO service engagement framework covering Tx + Fx + Ix Modules. ixCFO's Board of Advisors comprises of two top notch senior professionals from finance & business sector with decades of experience under their belt.